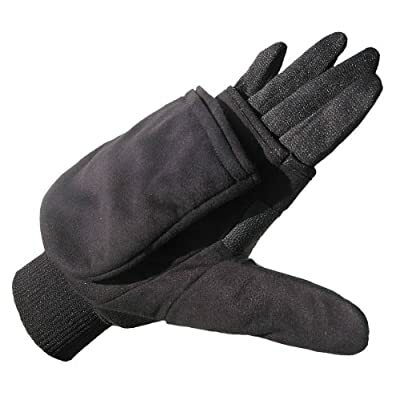 Great for skiing, cycling, hunting, snowshoeing, and more, Heat Factory’s gloves with Pop Top Mittens makes frozen fingers a thing of the past. The fold-back mitten cap has a specially-designed pocket that holds Heat Factory air activated Hand Warmers over the fingers, providing additional warmth on the coldest days. Each pair of gloves comes with one pair of Heat Factory Hand Warmers that provides up to 10 hours of continuous long-lasting heat (additional warmers are sold separately). Quiet magnets sewn into the top of the glove hold the mitten cap back and out of the way when dexterity is needed. When the mitten cap is pulled away, the inner liner of the glove remains in place to provide continued warmth and protection to your fingers. An elastic cuff at the bottom of the glove is designed to keep wind and snow out of the mitten and away from your hands. The rubberized palm grip allows you to hold items with confidence and ease. This combination of a time-tested design and Heat Factory warmer technology gives you protection and warmth in any condition. Heat Factory's air activated hand warmers, body warmers, toe warmers, and heated accessories have been providing warmth and pain relief to outdoor enthusiasts for the past 30 years.